While most kids ask for bikes or video games for Christmas, 9-year-old Shea only wanted a hand. Shea was born with a palm, a two-digit thumb, and no fingers on her right hand. After seeing a YouTube video last year about 3D printed hands, Shea decided to ask for a hand from Santa. After doing some research, Shea’s mom, Ranee Stollenwerk came across E-Nable, an online community of 3D printing hobbyist helping to create and make affordable prosthetics. Ranee sent a message to the community, asking for help in making her daughter’s dream come true. In her message, she confessed that as a full-time mom, and part time preschool teacher, she had limited knowledge of 3D printing. But her daughter’s excitement pushed her on. Frankie Flood, an associate professor at the metals department at the University of Wisconsin-Milwaukee’s Peck School of Arts, also happened to be a member of E-Nable. Hearing the little girl’s wish, Frankie set out to make the dream a reality. Having his own 3D printer at home, Frankie set to work printing parts for a 3D hand for Shea in her favorite colors: pink, yellow, and orange. While the hand was not ready in time for Christmas, Shea’s parents were able to tell her that there was a hand in progress. For the next few months, Frankie worked to create various designs to see which one would best fit Shea. And finally, in February, Shea was able to meet up with Frankie and his team to try the 3D printed hand out for the first time. 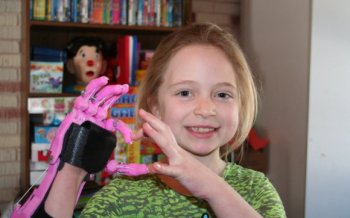 In a matter of seconds, Shea was picking things up for the first time with her 3D printed right hand. Frankie is now working to make the 3D printed hand, known as “Shea’s Hand” available online for free. The total costs involved with making the hand were less than $50, and Frankie adds that the design can easily be scaled as Shea grows.